Manufacturers and industrial concerns around the world are concerned about protecting their employees, visitors, stock, equipment, and property from the front office reception area throughout the industrial processes, and on to the shipping docks. Workplace violence, business espionage, terrorism, and theft remain additional concerns. In many situations, the environment can be harsh and challenging for security systems that are installed. Monitoring all aspects of the business with complete situational awareness while reducing surveillance costs is proven to be possible by Arecont Vision IP megapixel camera customers worldwide. “Arecont Vision megapixel cameras provide the extremely clear images that are needed for security monitoring of the facility perimeter. “A major benefit of Arecont Vision cameras is their reliability. Arecont Vision IP megapixel cameras are deployed around the world for manufacturers and industrial sites. 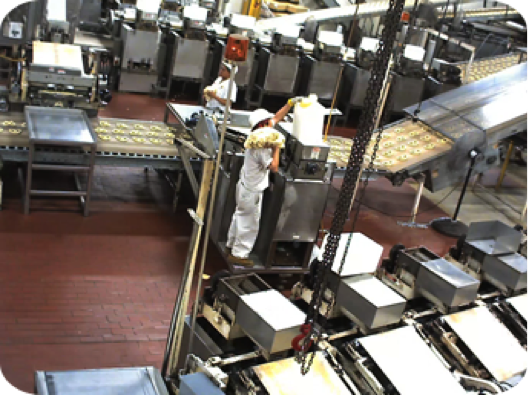 Manufacturing, packaging, and warehouse facilities can be monitored with Arecont Vision SurroundVideo® IP megapixel multi-sensor cameras for situational awareness.